In his weekly opinion column, Brian Walden considers the gap between science and religion - and what this might mean for the future of humankind. Sir Martin Rees, the Astronomer Royal, wrote something recently that chilled me to the bone. Sir Martin is the winner of the Michael Faraday Prize awarded annually by the Royal Society for excellence in communicating scientific ideas in lay terms. In my case he did almost too good a job. He pointed out that though the idea of evolution is well-known, the vast potential for further evolution isn't yet part of our common culture. He then gave an example. He said: "It will not be humans who witness the demise of the Sun six billion years hence; it will be entities as different from us as we are from bacteria." It may well be that this vision of the future leaves you unmoved. After all, six billion years is an almost unimaginable length of time. On top of that, the death of the Sun isn't going to be a jolly business and I suppose that if we're able to summon up any feeling on the matter it ought to be gratitude that there aren't going to be any humans around to suffer when it happens. These seem sensible arguments and ought to console me - but they don't. This is Easter and I can't help contrasting the Christian promise of my youth with what science expects to happen. There's a long established British tradition that in general conversation religion isn't discussed. The great Whig essayist, Joseph Addison, writing in the early 18th Century said: "We have in England a particular bashfulness in every thing that regards religion." That was in an age when belief in God was well-nigh universal. If it wasn't thought to be tactful then, it must be far worse now, in a secular age when Christian belief has declined and other religions are widely practiced. But it's for that very reason that I think we ought to talk to each other more about the central mystery of life. Widespread agnosticism and the place in society of Islam, Judaism, Hinduism, Sikhism, and Buddhism ought to mean that the climate of opinion is tolerant. Nor do we need to be expert to discuss science and religion, providing we have the humility to learn. Like many others, I eventually accepted the scientific explanation of the origin and destiny of mankind. But, also like many others, I have no hostility to religion and, in particular, no contempt for Christian faith; quite the contrary. Indeed, at Easter, I confess plainly that I miss the consolations of Christianity. I had a Pakistani friend, who died after a long illness. As he weakened physically, the subject he most wanted to discuss was the reconciliation of Islam and science. After a time, worried that he might be distressed, I said, very foolishly, that perhaps he could be at peace because Islam involved faith and he was a believer, whereas science operated in a different dimension collecting data, experimenting and seeking to confirm knowledge. This distinction made him angry. "Have you the slightest idea how close we are to the end of humanity?" he asked. "I'm a scientist and I'm afraid. Only from the morality inside us can we learn restraint and that morality must come from religion." I admit I thought he was exaggerating, but I listened and went away and consulted one of the works he'd suggested. I was unpleasantly surprised to discover exactly what my friend was talking about. It wasn't possible nuclear accident, or climate change, but the hypothetical threat posed by technological advances in genetics, robotics and nanotechnology. Genetics; in that we might intentionally or accidentally create a plague; robotics, where we shall be able to download human consciousness into machines and nanotechnology where a nano-machine might turn the biosphere into dust in a matter of days. Having heard a fair amount of doom-mongering in my time I'm resistant to it and disinclined to believe that the worst will happen. Nevertheless, lacking the scientific knowledge to judge whether there was a real threat, I asked some of those who did know. They were amused by my ignorance, but confirmed that without proper constraints the technology is a distant threat. Then somebody told me that not only was I not up to speed scientifically, but that some philosophers, well aware of the scientific facts, were discussing their moral implications. So nothing that I'm saying has the least originality, but neither is it freakish. A growing number of people believe that we need a fresh dialogue between science and religion. I mean religion in its widest sense - a belief in the value of human life. Apparently the direction of scientific progress means that we have to make moral judgements about what's permissible and what isn't. We need a moral consensus. Most emphatically, I don't mean that we need to create a sort of blancmange morality that wobbles about, containing a bit of God, a bit of physics, a dash of Catholicism plus a smattering of Buddhism and a few sprigs of well-meaning atheism. That kind of ethical coalition wouldn't survive, and we need something that will. What we all need is to acknowledge our interdependency. The hostility between science and religion stemmed from the 18th Century Enlightenment when science was forced to contradict some of the assertions of the Christian churches, particularly the Roman Catholic Church about the history of humanity. Political liberals had their own quarrel with the Catholic Church, regarding it as a reactionary influence in politics and wanting it separated from a secular state. So the liberals joined the argument on the side of science and we got what became the familiar division of liberal thought and science against religion, though naturally individual liberals and scientists were sometimes believers. This classic alliance between science and liberal thought in which the opinions of both are mutually reinforced, or the classic opposition between religion and scientific progress no longer operates across the board. Indeed the present abortion quarrel in Britain is a striking example of a new pattern. Professor Stuart Campbell took photographs of foetuses at between 12 and 24 weeks' gestation and he admits that it never entered his head that the pictures would touch off a national debate. 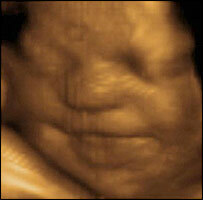 But the photographs were taken by a new technique showing foetuses younger that 24 weeks looking far more developed than had previously been accepted. The photographs changed some people's minds about late abortion, including Professor Campbell's. He now thinks that "24 weeks if the baby is healthy is too late". The wider significance of this episode is that the Catholic Church, which opposes abortion, finds that science has done something which helps the Church and not necessarily liberal opinion. Of course Professor Campbell doesn't share the Church's view on abortion. He supports abortion, but not as late as 24 weeks, pointing out that "science has moved on". So has the relationship between science and religion in my opinion. It would be sloppy thinking to claim there are no tensions and ridiculous to suppose that a common agreement can be arrived at. There can be no agreement, but there can be tolerance. The Prime Minister, Tony Blair, leading a secular party in an increasingly secular society, on Tuesday asked Britain's churches to play a bigger role in national life. Not just Tony Blair, but many contemporary politicians, want society to get what help it can from both science and religion. Now, in a spirit of tolerance can I do justice to the Astronomer Royal, Sir Martin Rees, who alarmed me by predicting a future species as superior to humans as we are to bacteria? Well Sir Martin has a dedication to humanity and shares Albert Einstein's view that we need a perspective that's global, humanistic and long term. He can't be expected to share the scientifically illiterate prejudices of somebody like me. Anyway Sir Martin doesn't rule out a place for humanity. He thinks spaceships launched from Earth might spawn new oases of life elsewhere. You see the interdependent, tolerant world doesn't have to be intellectually dull. I beleive that science and religion will one day meet. I think that we have not yet even started to discover the depths of physics and other sciences. Maybe the world really is a magical place, where ghosts and other mysteries can be explained in terms of science. A science we have yet to discover. Coming from Ireland I have seen first hand how religion can hinder progress. Divorce only recently became available, and abortion is still illegal. I do think that for some people religion is important, but for those that do not follow those beliefs, well why should we have to suffer for the ignorance it displays? I do not "believe" in science, as faith is not required. Science gives repeatable results when certain conditions are met. True science can cause harm, but religion can cause a lot more. Science is about knowledge, understanding. Religion is about closed minded views that you are right and everyone else is wrong and damned. Religion is not tolerant, not in it's "pristine" form, and not in it's current form. People tend to only take the bits they like, and ignore the bits they don't. Religion is hypocritical, science is analytical. In the end, one can help, one cannot. But the choice is up to the individual to make. As long as I do not have to suffer under some religion I do not believe in, I am happy to let others practice their religion, just don't expect me to worship with you. I would like to know what Sir Martin Rees thinks the crocodile will look like in 6 billion years time as it hasn't changed much in the past few million years. Faith is a personal matter and should remain so. As an atheist I find it infuriating that theists argue that there is no morality without God. This is far from true. Even the religious texts that offer ethical or moral guidance were originally written by men; therefore even religious morality comes from man. If I was to say that I had a lion shaped spirit-guide called Norman that guided my morality I would rightly be regarded as insane, yet when millions of people follow a faith based on the same logic they are members of group we regard with respect! Modern religions are moderate despite what their texts teach, not because of it. For example, if Christians followed their faith correctly you would be killed for wearing clothes made with mixed fabrics. It is secularism that guides our morality, not faith. I have not read such a good article in a long time, as a Christian I am used to being told that I am wrong and my faith and religion has no place in todays world. But here we see the only place where we can expect the moral restraint to come from is in religion, this is quite a turn around opinion indeed. Science is going well ahead of human reasoning and constraints, if there is no moral guidance in what is experimented then who knows what we will end up with! Already we are fast heading towards the society where babies are born only after being designed by their parents, designed to "fit in" with current fashions on how they should look and of course they will be intelligent and those who come out as a mistake well they will clean the streets and toilets. Moral stance will hopefully prevent this from happening, if not then the human race will not survive to eveolve like thought but destroy itself in the pursuit of "perfection" Thank you for this article. I'm a catholic but having read a few books, including the "Da Vinci Code", I now have doubts about the fundemental tenets of Christanity. This article calls for a new accord between science and religion, which will appeal to those of us who find ourselves in the gap between the two. What I'm looking for something that fits into my world, I want something spritual and something that guides me without being patronising or dictatorial. The apparent contest between science and religion is a false one brought to us by history. A person honestly searching for God should not be afraid of a search for fact in science. Science now turns it's hand to questions normally handled by religion. Where do we come from? let the tax payer have an interplanetary probe at a billion a pop. It might not succesfully find life but it succesfully shows the questions remain the same. I believe that everyone is involved in a constant conversation about morality and the future of the planet. The fact that we have an aversion to religion in these conversations is an indication of tolerance. If we bring religion into any debate , what has it to say other than "My book reckons this" or "This would please God"? I wonder how much Mr.Walden's views have been influenced by the unflinching faith of the non-christians(even the scientists among them). I think instead of arguing for a place for the church among the white secular populace one should fight against the unquestioned religionism of the British minorities. Secularization of the non-Christians is the way ahead and not the Christianization of the seculars. How interesting. I love sci fi and it is really fun to imagine a world that is not human exactly. I suppose evolution will run its course, but whether we ever resemble anything we have imagined, it is not surprising science has once again managed to take the story even further! It may refute some religious beliefs but at the same time it also sparks off imagination to some like me- and here we see this theory come into play in a certain degree- the evolution of ideas!! Someone much wiser than I once said, "Four billion years ago the earth was molten rock, now it sings opera." It seems that we're all made of the same wondrous stuff, stuff that's always being tweaked and pulled, constanly rearranged throughout the ages by forces we are just beginning to understand. When the dinosaurs roamed the earth the stuff of what we are was there too. Dinosaurs and palm fronds, cabbages and Kings. We can't know what shapes matter might have assumed when our sun dies, but the stuff of what we are will be there. And who knows where else? "I mean religion in its widest sense - a belief in the value of human life." Non-religious people can and do believe in the value of human life, it is not the domain of religions. Religious thinking has no place in science, the fact that religions rely on faith and indoctrination should make that obvious. If you argue for a closer relationship then which religion are you goign to choose, they are all mutally exclusive. It's still the bacterias that are taking their toll on us humans, not the other way around, so I wonder in what way Sir Martin Rees thinks we are superior to them? Unfortunately, intelligence is not that important when all is said and done. Yes, I think intelligence is our strongest card, but I just don't think it's strong enough. Sir Martin Rees was not neccesarily refering to science chnaging humanity. In six billiion years whatever life forms exist on this planet will be competely different from us due to natural evolution. Less than one billion years ago there was nothing more advanced than an amoeba. As an atheist, I reject the view that religion has something special to offer in moral debates - it is far more important to educate and involve our overwhelmingly secular society as a whole. Why should churches play a bigger role in national life when their influence has been consistently waning for decades? Science is, of itself, a form of religion. Man requires to believe in something, anything, so if not in God then what? Certainly not himself. Man believes in his creations perhaps in the vain hope that someday, man's creations will believe in him. Then man will become the God that he doesn't believe in - and he still won't believe in himself even then. Religion exists to guide the morals of a society, and that it does quite well. I believe that it is needed for just that reason otherwise we'll devolve to a society where anything is permissable for the furthering of science. Religion teaches us to place a value on the lives of our fellow humans, something that tends to interfere with scientific research. Both have a clear and defining place in any society, one operating as a base from which to learn and the other as a base to guide moral decisions. Without both essentially irreconcilable ideas operating at the same time we would devolve back to animals or forward to machines. I prefer to be as I am, just human.